A tidal wave of data has hit marketers in recent years, leaving most struggling to work out how to capture, analyse and use it to benefit their marketing campaigns – and organisations. For those drowning in data and wondering how to move forward, a creative burnout analysis can make a good starting place. This uses data to analyse a marketing campaign, or creative, over time to identify where performance begins to slide. Because the fact is, all creative experiences what’s known as creative burnout, reducing in performance over time and volume. A creative burnout analysis enables advertisers to gain a clearer understanding of when a campaign is reaching its use-by date, and needs a refresh or replacement to maintain optimal performance. 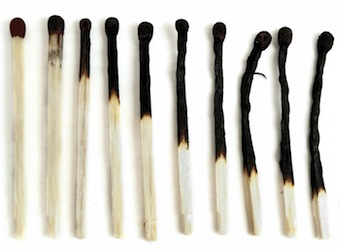 So, how do you go about a creative burnout analysis? To get technical, creative burnout analysis primarily involves two major components: yield and term. These are primary measures of the value received for your investment. In any CPM-based model, a higher CTR or other KPI increases an advertiser’s return on their CPM investment significantly. Impressions measure how saturated viewership of a piece of creative is and measures the performance based on this saturation. Days, weeks, or months measure performance by time value. Generally, the yield is CTR or interaction rate, while the term is impression level. Term is used to incorporate time, as more and more impressions happen as the campaign progresses. The use of days/weeks/months is especially useful when looking at seasonality or other factors. Excluding this circumstance, impressions level is the optimal use for measuring creative burnout. Understanding your own creative burnout helps determine at what point to optimise, or even retire, your campaign based on your ROI needs. But it is also helpful to understand how the media and creative choices you make impact creative burnout. An analysis of one billion impressions, over 75 campaigns, and more than 200 ads, shows creative burnout varies according to creative type. 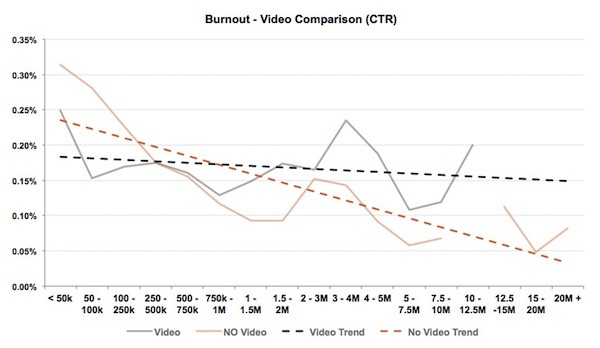 This graph shows video ads maintain performance far better than non-video ads. Over more than 20 million impressions, the average video ad saw a 15 percent reduction in performance, while non-video ads saw their performance decline by over 75%. While non-video ads perform better for the first 750,000 impressions, they do not maintain consistent performance as impression volumes increase. Also, it is worth noting that these are much lower volumes where data can be less reliable. 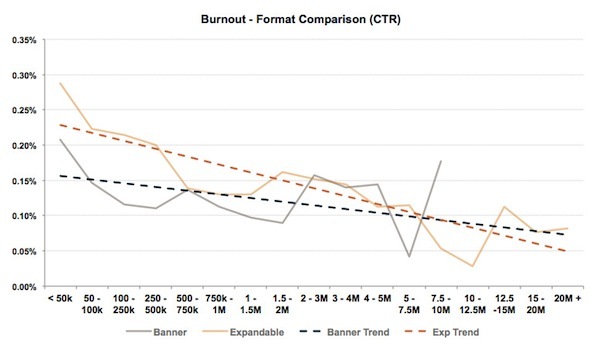 This graph shows expandable creatives see their performance decline at a faster rate than standard banners. But with a performance starting point at 50% higher than standard banners, the overall value of expandables is still greater by over 40%. We can draw broad and specific conclusions from this analysis. First, the data indicates that ads with greater interactivity levels and engagement opportunities – such as video or expandables – maintain performance longer. While these ads cost more to build, the investment can be worthwhile as they deliver results longer. More broadly, creative burnout is a useful analysis tool for identifying the performance arc of any campaign/ad/placement. Advertisers wanting to optimise their creative performance can benefit by using data to identify their own creative burnout rates. Any analysis will, of course, also need to consider other variables, such as seasonality, ad format, ad size, vertical, or even brand, which also impact creative burnout rates. But once the habit of regular creative burnout analyses is formed, advertisers find they can use the lessons learned from this to improve the overall performance of any campaign. Adam Michalewicz, Business Intelligence Group Manager, MediaMind contributed to this article.